People often ask what it takes to be successful at spread betting, and the answer is not straightforward. Sometimes it is assumed that mathematicians or statisticians are the ones most likely to succeed, mainly because spread betting involves a lot of numbers; but the truth is that some people who are not particularly good at arithmetic can make good traders and sometimes astoundingly well! Proficiency with numbers is not a prerequisite. When I first started spread betting and futures I read that success was based on 10% knowledge + skill and 90% psychology. I doubted this at first but can tell you now that it is SPOT ON. The knowledge of what moves the markets can be learnt in a matter of months (it’s not rocket science). But managing fear and greed is the hardest and takes most traders YEARS. If you use some ‘tricks’ you can help your chances of success. And of course being disciplined and shrewd when placing your bets helps but remember that at the end of the make to make money you have to spend money. So what can we do to improve the national performance? Avoid making too many mistakes – that would be one obvious answer. That’s your best shot at trying to make money from the stock market although again there are no guarantees. It is all very inspiring to read ‘success’ stories but unless you have an unrelenting manner and lots of willpower (and even sometimes when you have) to succeed it can be a fantasy, a dream, something that happens to the lucky ones! But reading the stories or real traders and their downfalls can show the reality of the other side, the bits people hide, the stories they don’t want to share, it can show (to my mind) loss of control that can occur if you don’t manage yourself. I have read lots and lots of autobiographies of successful entrepreneurs and famous businessmen and I have to say it is surprising how many people make it, lose it, make it again with spectacular success (Simon Cawkwell is one of them) there are more..! However, you can improve your probability of success by learning from the experts. What does it take to be profitable spread betting? You have to love what you do. Be passionate about your trading. One of the secrets few know when it comes to trading success is that you have to really care about doing well. You need to be constantly looking to improve what you do, and view it as a challenge. If not reassess why you are doing it, and possibly change the aspects of the job that you hate. You might go to bed pissed off at yourself, but you need to wake up every day thinking today is a new day – how can I make some good spread trades. You have to be able to admit when you are wrong. you WILL make mistakes, accept it. You can’t always have winning trades and you are likely to experience a mixture of profits and losses. That is why you should never stake money you cannot afford to lose. Plan for what to do in your spread trading when this occurs. eg; get up walk away for a while, trade smaller, whatever works. If there is nothing to do as a trade, don’t trade (or find some other outlet for your gambling tendencies – e.g. reading forums, or pick a liquid low volatility speculative instrument to get your fix, get drunk, play monopoly). To be a successful spreadbetter you need to have sufficient self discipline to only trade when the markets conditions are strongly in your favour. Get understanding – not just knowledge. Knowledge is found in a book, understanding is found through your own thoughts and processes – copying others just won’t work. If you don’t understand something then don’t participate – first learn, then understand, then participate. To be successful spread betting, first you have to understand that it is not a good game plan to rely on luck. I think one of the secrets to success in my opinion is research which means keeping a watchful eye on the markets that interest you and industry developments, then of course you need to call it right, but the more informed your decision the better the probability of your success. Trading is a business, and you need to do some homework to find the best opportunities and to profit from them. Having a trading system is important, and sticking with it — as long as it has been tested successfully – through any losing streak is essential. The most difficult part of financial trading is dealing with the mental issues, and emotions such as fear and greed. Secondly, although spread betting in particular seems to require little investment because of the leverage that your money can have, to be successful you need to be properly funded, with money that can be used for spread betting because it is not needed elsewhere. If you are reduced to using the grocery money because you had some unfortunate losses, then you will not be able to trade effectively. It’s important that you choose a trading system that suits your personality, and can fit in with the time that you have available. For instance, it will be no good to use a day trading system if you have a full-time job and cannot watch the market. This is an obvious example but there are more subtle issues to be considered, such as how large a drawdown you can stomach before you abandon your system or quit trading. Some trading systems, though they have a good overall profit potential, can reduce your account significantly during bad times. For successful spread betting one of the aspects which you must master is money management. Most spread betting traders have experienced at least a small run of poor performance when trading the markets In fact, the key factor for success when it comes to trading is not so much about getting the majority of the trades correct – which of course would be great (!) – but the balance between the winners and the losers in money terms. It is money management and in particular the reduction of losses that keeps the spread trader in the game long enough for the winning trades to run their course and offset the ample losses on the way. Some successful spread traders even have more losing trades than winning trades in any given year. Money management is essential here, and involves all aspects of your spending on spread betting. A fundamental part is how large your spread bets are, and this has to be considered in conjunction with how much you can afford to lose, and how much you think a position may run against you before you decide to take your losses. The main factor to success is to make the most of this trading medium without getting hit too hard on the downsides, because inevitably you cannot get it right all of the time. Successful spread traders know precisely where their cut-off point is on a trade and have a better feel for that than their price target. In quite a number of cases they might not have a set exit point in mind and will run a trade until the trend fully rides out or there is a change of sentiment. Which is not to say that price targets are not worth having. Before entering a trade always ask yourself – ‘If my stop level is at this level, can I see the stock price moving to three times the potential unfavorable move?’ If you envisage this possibility, then the trade is probably worth taking and your exposure will then be dependent on the potential financial loss on such a trade if your stop is triggered. But winning and losing money creates its own challenges, and as mentioned above the mental issues overcome many beginners to the financial trading markets. Until you have experienced winning and losing real money at the whim of the market, you will have no real idea how much self-control you are able to exercise. It’s an old adage that you should cut your losses and let your winners run, but it is still very relevant. If only half of your spread bets move into profit, which by the law of averages they should do, as long as you allow the winnings to mount up and make sure you close out losing positions quickly, you will still come out ahead. 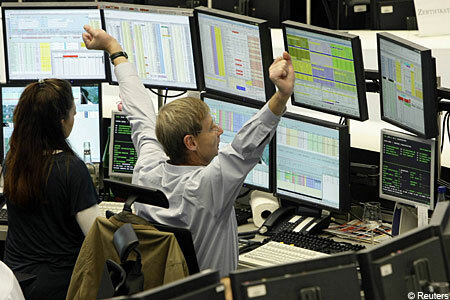 Successful spread betting requires you to combine all these factors so that you will be a winner. What are your strengths as a trader and what are the differences between you and other traders? I have the capacity to become more aggressive in winning phases, and to take on bigger risks while scaling back during losing times. This is contrary to human nature. A good thing to have is to have somebody around who is neutral to trading, who switches the trading screens off when a certain level of loss has been reached for the day. The way I’ve interpreted this is that if you have those two qualities, you’ll seek out the right trading coaches, the right education and will strive to acquire the right mindset to succeed. It may not happen all of a sudden, but it is inevitable that it will happen at some stage. This has always filled me with a lot of confidence. The statement that people love doing things because they are good at doing them simply doesn’t hold. People are good a particular skill because they love doing what they do, and will spend a heck of a lot of time practising. If you truly want to become a successful trader, make sure it is something you really enjoy exploring in the first place. This will help give you the motivation required to push you onto trading success. The one thing the successful traders all have in common is they plan their trades and are disciplined enough to keep their losses down to manageable levels. Having said all this remember that experienced and successful traders make trading look easy (even if they don’t mean to) – and I consider that this could be dangerous – just like it would be dangerous to follow an expert trader into every trade – every trader has their own level of self discipline and their own level of risk and of course their own (and probably very different) level of capital. As for us, our success in providing clear step-by-step explanations is reflected in the outstanding results we have and continue to have in training students from the most diverse backgrounds and levels of experience to become successful and ultimately profitable spread traders. “We want our clients to be long-term traders and many will only become that if they are successful” – says Ryan O’Doherty, co-head of product development at CMC Markets.